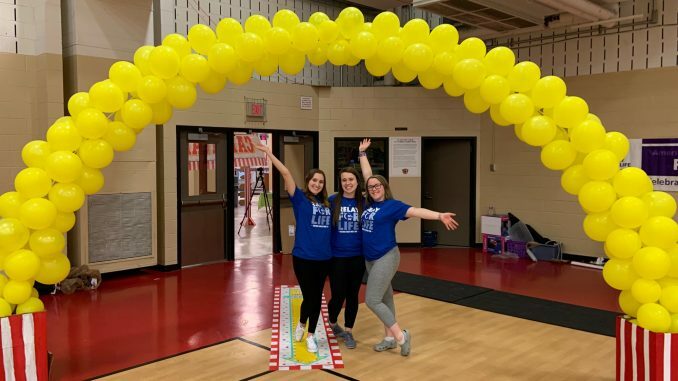 St. John Fisher’s Colleges Against Cancer (CAC) club hosted the 17th annual Relay for Life event at the Ralph Wilson Junior Athletic Center on Saturday, April 6. The event is a 12-hour walk-a-thon with games, ceremonies, and other club events all dedicated to honoring people who have lost their fight with cancer, and for those still battling the disease. It also works to support the many families of those who struggle with the disease’s hardships. The event began at noon and ended at midnight, and raised $12,294 worth of donations. The money raised from the event is donated to Rochester’s Hope Lodge and the American Cancer Society for research efforts. The gathering consists of students, faculty, survivors, families and locals of Fisher participating in events held by the students featuring games with prizes and awards. A main goal of the event is to, “Raise awareness about how people can get involved with the fight against cancer,” explained treasurer Amanda Vaquero, a junior and three year Relay for Life and Colleges Against Cancer member. As a national organization, Relay for Life has over 5,000 events each year in over 20 countries in the U.S. 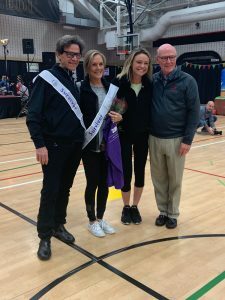 The event is sponsored by its parent organization, the American Cancer Society, and is a welcoming event that holds the hearts of many at Fisher. Vaquero explained that the CAC club spends the entire year planning for the event. “Planning for the next relay begins shortly after the other one ends,” she said. They start by discussing things like the event’s theme, roles for the upcoming year, and the finer details come along during the Fall semester. Vaquero said that she “just looks forward to everyone coming together and having a good time for a really great cause… That’s the most rewarding part of it all.” The money raised goes to local place right in our community at the Hope Lodge, along with adding to the funds for cancer research. Vaquero mentioned that many of the club’s members have friends or family members that have been affected by cancer, so the club is very passionate about raising awareness.